Becoming a wife and mother was always a dream of mine, even from a very young age. But I didn’t want to just be a mom, I wanted to be a stay-at-home mom. But after growing up into adulthood, and finally realizing the true cost of a mortgage, electricity, cars, clothing, food, and everything else a family needs to get by, I didn’t know if being a stay-at-home mom was going to be possible. Could anyone make it on one income so that the mom could stay at home? After giving birth, and being a mom for just a few weeks, I knew in my heart that I couldn’t give up my baby to complete strangers at a day care for 8 or 9 hours a day. But I still had doubts about whether or not we could afford me staying at home full-time. After some number crunching, and honest soul searching, my husband and I decided that we would become a one income family. And while we’ve had some hardships along the way, it was the best decision we could have ever made. 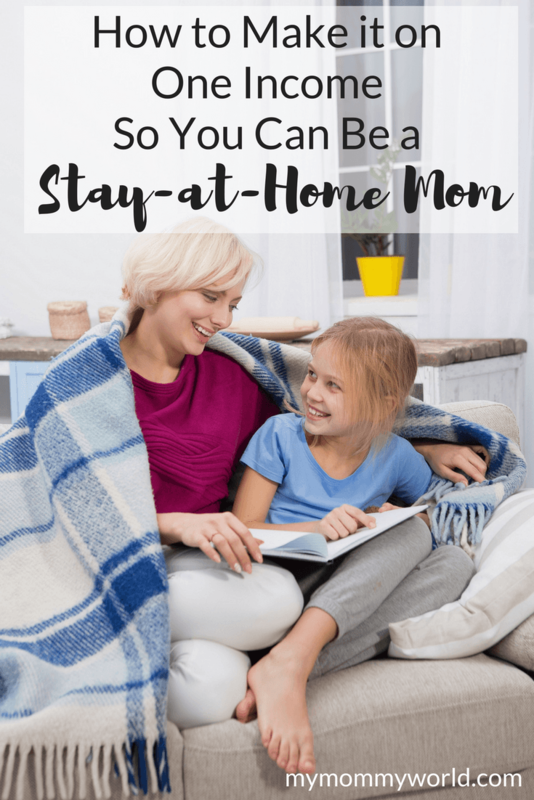 If you’re thinking of becoming a stay-at-home mom, but aren’t sure if your family can make it, let me give you a few things to think about so that you can get prepared. The first thing you need to do if you want to leave work and stay home full-time is to do some number crunching. That means sitting down with your spouse and writing out all of your expenses, then comparing them to your income. If you find that your monthly expenses will be fully covered by your spouse’s income, then congratulations, you are ready to stay at home. But if your monthly expenses far exceed your one income, you need to decide: how much are you willing to sacrifice in order to be at home with your kids? The benefits of mom being at home full-time are well-known: the kids get more time and attention, they are exposed to fewer illnesses, and household routines are less hectic, leading to less stress on the family. So while having mom at home is great for the well-being of the kids and family, it can be difficult to live on just one income. But it’s not impossible! A little bit of planning and a change in mindset can go a long way to living a great life on a smaller bank account. First things first: make a budget. Knowing exactly how much you are going to spend on housing costs, food, entertainment, clothing and any other expenses is critical. There’s nothing worse than splurging on a new outfit or a fun outing and then realizing that you don’t have enough cash to buy groceries the following week. Make sure you have all your important expenses covered and then divvy up any leftovers for entertainment or savings goals. Writing checks to cover debt payments is no fun, especially when that means your dream of staying at home can’t be realized because you need extra income to cover them. That’s why paying off your debt can really go a long way towards lowering your overall budget and making it more feasible to live off of one income. You may want to consider selling any big ticket items in order to pay off debt more quickly. And however hard it is to part with your dream car, it helps to consider that being the one to watch your child take their first steps is so much more fulfilling than sitting in an office all day every day in order to pay for that expensive car. When planning to live on one income, we have to make some choices about the kind of lifestyle we want to lead. For example, it might not be possible to eat out as often as the family that has two full-time incomes. Choosing a more frugal lifestyle in order to make it on only my husband’s income has been a bit trying at times. We own the smallest house in our neighborhood and don’t take a vacation every few months like some of our neighbors. Our cars are also older and I don’t wear the most up-to-date clothes. But being able to be at home with my kids and having a less rushed lifestyle is worth it! I can get all the household errands done during the week so that our weekends are free for family time. We eat out less because I have time to cook, instead of running through the drive-in on my way home from work. We also don’t have to pay for after-school care for the kids, since I’m home when they are done with school (and we can enjoy a snack together when they get home!). Shopping: How often do you need new clothes? Can you find similar styles of the clothing you are used to wearing at lower-cost stores? Grocery budget/meal planning/coupons: How can you use meal planning, coupons and shopping sales to decrease the amount of money you need in your grocery budget? Cars: Do you need two brand-new cars for your family, or can you make-do with used cars? Do you need that big mini-van or can you downgrade to a smaller SUV? House: Is your house payment too big a percentage of your overall budget? Vacations:Can you cut back on the number of vacations you take? Is there an alternative you can do as a family to have fun together without spending so much on airfare/hotels/meals, etc.? Memberships:Do you need to keep your gym/golf club/museum/bulk-shopping store membership? Cutting back on a few items can really add up to big savings in the long run, making it possible to live well, even on a smaller income. Comparison is really where we can get tripped up in our pursuit of our dreams of becoming a stay-at-home mom. When we see all the moms on social media with their perfect clothes, shiny new mini-vans, and expensive vacation photos, we can sometimes feel a little inferior or envious that we don’t have the same things. Comparison has caused me to make some dumb financial decisions in the past. When my kids were very young, a good friend of mine went to Disney World for a week with her family. They had a character meal everyday and posted lots of fun-looking photos that instantly made me feel that we had to do the same thing. Months later, we used our tax refund to take a trip to Disney, complete with…you guessed it!…character meals everyday. While we did have some fun, most of the trip was miserable because my kids got tired waiting for the characters to visit at the special meals, were grumpy having to wait in long lines for rides, and got to the point where they refused to pose in any more pictures (which made Mom grumpy, because after-all, they were supposed to be having fun!). That trip taught me a valuable lesson…to enjoy my friends’ photos, but not to take them to heart, as if I was failing my kids in some way. It has also helped us learn to be content with the small day trips we do sometimes take, as well as with our smaller home and trusty cars. Once you’ve made the choices required to become a stay-at-home mom, you need to get your family budget organized. You can download my free household budget form to use to make a new budget every month in order to stay on track with your spending. There are some great tips on using digital budget tools in my keeping track of your household budget post, in case you aren’t a fan of paper and pencil. And if you need some more advice on how to reduce your household spending, check out this post on smart spending habits for the stay-at-home mom. It also gives you some tips on how to treat yourself on a budget! Living on one income can be challenging in today’s world of extravagance and highlight reels on social media, but being a stay-at-home mom can be more rewarding and fulfilling than any vacation or piece of jewelry. I remember the early days of being a one income family. It was hard at first but then the things we do to save become second nature and it gets easier. My husband and I talk about what we would do differently if we had “extra money”. There are only a few things we would change and those are luxury things. I think when your family is your main focus, giving up material things becomes easier.